In Team Teaching Science, Ed Linz, Mary Jane Heater, and Lori A. Howard demonstrate the truth in the old adage “Two heads are better than one.” This guide for developing successful team-teaching partnerships that maximize student learning will help preservice and inservice special education and science teachers in grades K–12, as well as methods professors in science education programs who want to cover special needs issues in their curriculum. Using both research-based practices and personal insight from experienced team teachers, the authors strive to make team teaching beneficial for students and accessible for teachers. 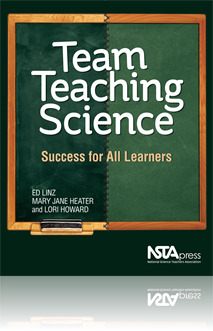 Linz, Heater, and Howard provide background information on science teaching and team teaching and, most important, six chapters on how to teach specific science topics and how a co-teaching team can proceed through the school year. The basic elements of collaboration are introduced, along with chapters on co-teaching strategies to implement in elementary, middle, and high school classrooms. The authors, who have years of co-teaching experience, offer practical advice that teachers can apply to their own classrooms. Teaching a diverse group of students is one challenge teachers will likely encounter in a team-teaching environment; the authors address the difficulties that may arise, as well as issues related to assessment, curriculum, and necessary accommodations and modifications. For those tackling the challenges of team teaching, this book will prove to be a valuable resource for making team teaching a positive experience for both students and teachers. “This book is a superb resource for new and developing teachers. Team Teaching Science provides much needed assistance due to its well-structured, practical approach and invaluable checklists."